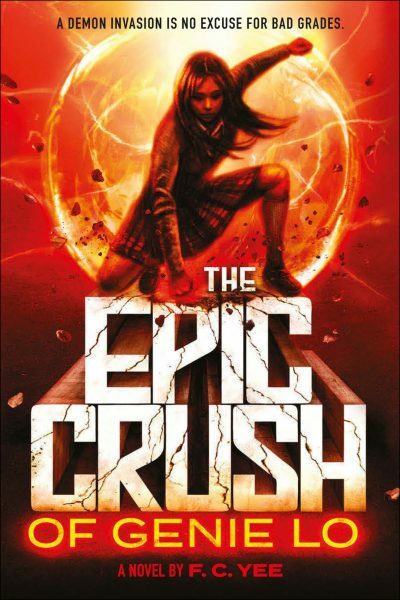 2017’s The Epic Crush of Genie Lo is F. C. Yee’s debut novel. Bay Area high school student Eugenia “Genie” Lo is highly motivated and hard-working, determined to earn her way into Harvard. She’s going to claw her way to the top, despite all her equally motivated, hard working, and better-connected rivals. Harvard is not just a top-ranked school. It is as far from Genie’s well-meaning, interfering mother as it is possible to be without leaving the United States. Genie does not need distractions on her journey to the east. She gets a major distraction in the form of brash transfer student Quentin Sun. Also known as Sun Wukong. Also known as the Monkey King. That Monkey King. The Monkey King is convinced that Genie is the reincarnation of an old companion from the Journey to the West. Not monk Xuanzang, pig-man Zhu Baijie, nor reformed demon Sha Wujing. Not even the Dragon Prince who served as Xuanzang’s horse. Sun is sure that Genie is Ruyi Jingu Bang, Sun’s all powerful As You Will staff. Inanimate objects are not generally known for reincarnating, but the Ruyi Jingu Bang was a very special and very powerful weapon. Sun is certain that it somehow managed to manifest as a human. Genie is understandably skeptical. The number of Bay Area high school students who turn out to be figures from one of China’s Four Great Classical Novels can be assumed to be in the rough vicinity of none, more or less. She begins to suspect Monkey may be on to something when her arm stretches during a heated exchange with the Monkey King. Size-changing was one of Ruyi Jingu Bang’s attributes. Sun’s presence has consequences. Mythical figures are plot magnets. If the Monkey King moves into the neighbourhood, expect Monkey King-scale challenges to follow. It doesn’t take long before Genie finds herself facing off against the sort of demons who plagued Monkey and his companions during the Journey to the West. Inexplicably, the demons who appear are ones who should still be dead and in hell, where Monkey put them. It seems Red Boy, a demon who particularly vexed the Monkey King, has staged a mass escape. The demons of hell are free and bent on revenge. The Monkey King might be able to survive the carnage that is to come. The humans of Bay Area are more likely to serve as delicious appetizers. Heaven’s Jade Emperor takes a hands off approach to the mortal realm. No hope of intervention from the Celestial Court. If Genie’s family, friends, and all the other people in the Bay Area are to be saved, Monkey and Genie will have to save them. It’s hard to understate just how annoying Monkey can be. It’s as though handing enormous amounts of power to someone with legendary impulse-control issues is a bad idea. Still, better Monkey than his enemies. Monkey may need personal improvement, but at least he doesn’t eat people to absorb their spiritual powers1. In general, with the exception of Bodhisattva Guanyin, the figures of Chinese myth who wander on stage don’t seem to have personal likeability as career goals. Well, that’s gods for you. Long on what is owed, short on what they might do for others. The plot is fairly straight forward: Genie learns who she was; Genie reluctantly accepts this is true; all the demons of hell descend on San Francisco. Genie’s personal life becomes a lot more complicated than she wants or needs. Busy with her heroic career, she doesn’t have time for her friends and family. Then there’s the big reveal followed by a giant battle at the end. This is essentially her origin story and it’s a bit of a shame that this book is thus far a standalone. Monkey is entertaining but of course only a supporting character. The book is carried by Genie. Genie is ambitious, sarcastic, and dealing with mom2 issues. Her mom is scarier than demons. Perhaps because she is already toughened up, Genie refuses to take any crap from Monkey. A refreshing change from all too many urban fantasy protagonists! The Epic Crush of Genie Lo is available here (Amazon) and here (Chapters-Indigo). 1: On the plus side, if legions of ravening demons were to eat the spiritually advanced people of San Francisco, this might exert a downward pressure on housing costs in the Bay Area. On the negative side, how many of the people driving the soaring cost of living in the region are spiritually advanced? Plus, the demons will have to live somewhere, so it may all end up being a wash.
2: Also dad issues. Dad made some unfortunate life choices, went broke, moved out, and is currently working at a gym. The break of the marriage (and Genie’s occasional forays into the Parent Trap territory) also shape why Genie reacts to certain things as she does.